After lunch - where you should definitely sample some of Kuantan’s famous fish crackers - we tackle an 8km plantation test which proved extremely popular on the Road to Mandalay event. 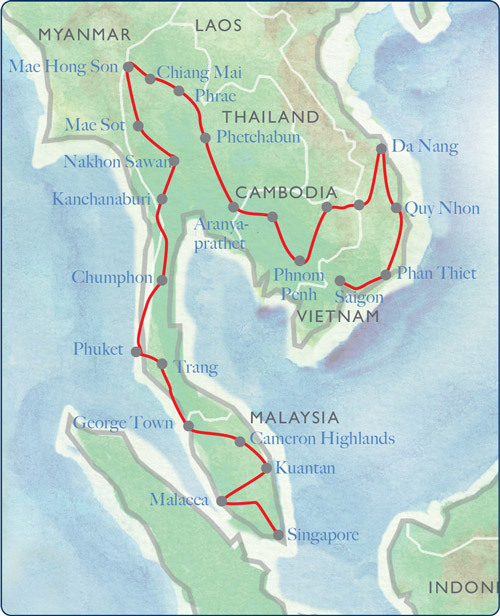 A highway run takes us up the isthmus … not an undiscovered ‘Carry On’ film but the 11km wide strip sandwiched between the Myanmar border and the South China Sea. This takes us to the Majestic Creek Golf Club for an early lunch halt before we embark upon an exhilarating perimeter roads test. Afterwards, we head to the Kaeng Krachan circuit - the longest race track in Thailand – where the tarmac specialists will have a ball! From here, we let our pulses return to normal and get set for a rural run to the infamous River Kwai and our impressive hotel for tonight, which is sited on its bank. Rural roads and some demanding navigation sections take us, via a short test, to the ancient Thai capital, Sukhothai – the ‘Rising of Happiness’ - and a lunch halt among the ancient monuments. After lunch, we follow some unusual gravel sections through farmland and then onto the roller-coaster highway to the city of Mae Sot where there is a busy and important jade and gemstone industry, bustling markets and a general feeling of fun and enthusiasm. Today’s rest day affords us a chance to recover from yesterday’s efforts in this interesting city – the largest in northern Thailand - which is surrounded by some truly spectacular countryside. You can choose to kick back and relax in our fantastic hotel or take a trip out and visit the Old City which has architectural remains from its history as a cultural and religious centre as well as many Buddhist temples. There are also multiple other tourist activities including zip wires that skim the jungle canopy and offer the opportunity to spot a gibbon or two as you pass through and the Elephant Nature Park which has been saving and providing sanctuary for elephants since the 1990s. Visitors here can feed, bathe and hang out with these magnificent and intelligent animals safe in the knowledge that they are utterly content and free from harm. To the hills! Waving goodbye to Chiang Mai will be a wrench but we’ve got a schedule to keep to… We’re back into the hills and then a run through a mining area which keeps us occupied until we stop for lunch. Afterwards, the Lampang Motor Club has devised a test for us before the run down to Uttaradit – the Port of the North - where we are promised a very warm welcome.